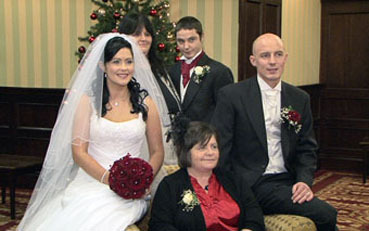 I was filming the wedding of Donna Cooper & Alan Davis on Thursday 6th January 2011, my second wedding of the New Year. 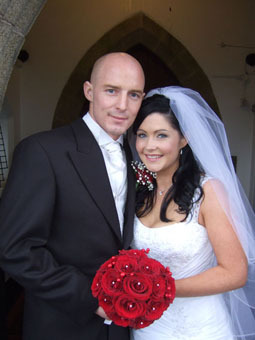 The wedding started with both the Bride & Groom, Donna & Alan getting ready in Cabra Castle up in Kingscourt Co Cavan. I was able to cover both of them, Donna with her 3 bridesmaids and their lovely daughter Shauna who was flower girl and their son Ryan who was pageboy. 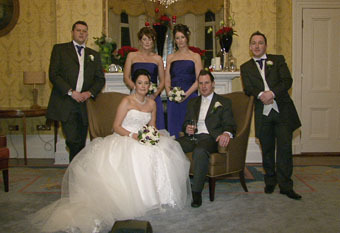 I worked with a new photographer from Drogheda called Nikki Mc Donnell, a lovely person. The weather was a little on the cold side but that made no difference to the happy event and everyone was having a lovely time. The good family and friends all 120 of them had a great time and the crack was mighty, Laura the banqueting manager from the hotel was on top of everything all through the day. 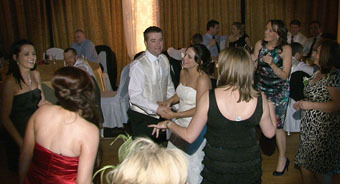 We had the wonderful band called Electric Avenue and they don’t let up, they have you dancing from start to finish, what a band they must be one of the most professional wedding bands I have seen in a long time. We all had a great day. 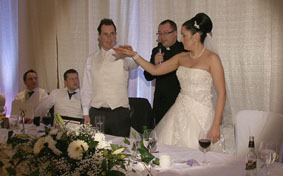 I videoed the wedding of the Year well it was New years day 2011. I started off in Edwina’s House In Kilmeague, were the house was so calm and Orva & Kendra, Ewinda’s Bridesmaids were helping with the final preparations. The church was the beautiful Holy Trinity Allen Co Kildare Fr. Liam Merrigan was excellent and was very accommodating in every way, his mass and ceremony were the most personal I had heard in years and we had beautiful music by Sorcha Fenlon & Niall Mulpeter. 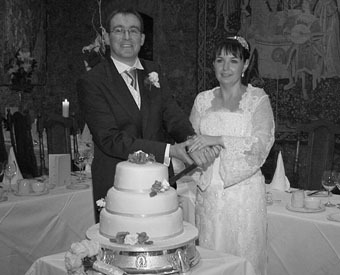 The photographer was Leon’s’ Uncle, Tony Maher from Carlow and this was his final wedding after 43 years in the business. 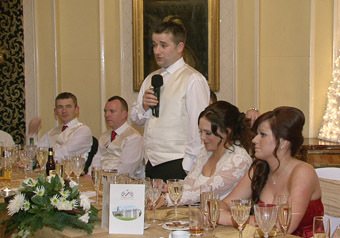 The day was lovely apart from a little rain but that did not dampen the sprits one bit, we got some lovely pictures in the wonderful Barberstown Castle were the reception was being held Paddy & Richard were on hand to make sure all ran smoothly and on time. The staff could not have been nicer from start to finish and that was clear from the number of times they were referred to at the speeches. The night followed with a great band called Apollo they are well worth checking out. 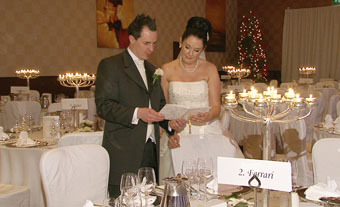 I was out filming the wedding of Eveyline Dowd & Declan Clarke on Thursday the 30th December, we started the day with Eveyline and the girls getting ready, all went well with the last minute preparations. We then headed to St Anne’s Church in Bohernabreena, I have worked in this church many times, it is quaint church but full of character and we had beautiful music by Alison Carroll & John Mc Cormack, they can be contacted on 087 3288588. 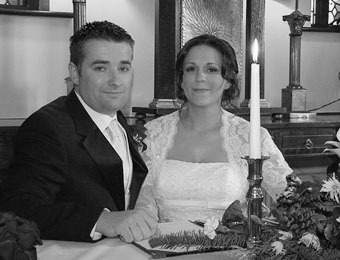 Myself and the photographer Dennis O Sullivan were give the freedom to work away in the church. 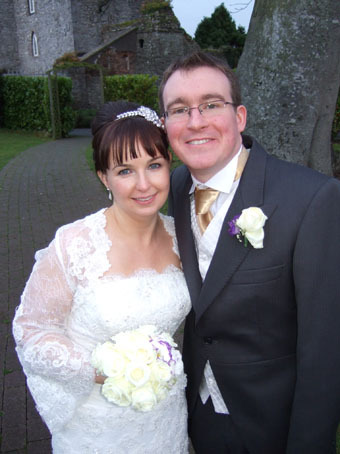 The day was lovely and we made the short trip to the Glenroyle Hotel, the staff could not have been nicer from start to finish and a great day was had by all. We all had a fantastic day. 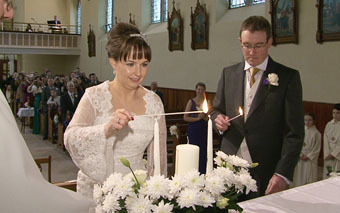 I was out on the wedding of Clodagh Mc Cabe & John Elliffe on Monday last, 27th December in the Church of The Nativity in Saggart, I have worked in that church many times and I only live a few miles away. The church was beautiful with its large Christmas tree and a lovely crib just in front of the alter, Fr Michael Shortall was excellent and was accommodating in every way, the mass and ceremony were very personal and the atmosphere was added with the lovely music from Claire Malone & Dave Russell. Myself and the photographer Viv Van Der Holst were made feel very welcome. I started at the church and the first to arrive were John, best man Alan and the groomsman Michael. The day was lovely and it made a change with no snow that we had all been getting used to, we went then to the lovely Lyrath Estate in Kilkenny only an hour from Dublin well that is with the new motorway ha ha….